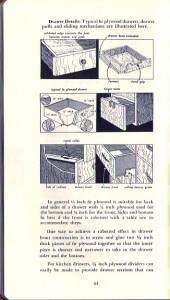 I always thought of plywood as a very mid-century material, probably because of the Eames’ chairs, and was surprised to learn that the basic lamination of veneers goes back to the ancient Egyptians, but up until the late 30s it was a material hampered by the fact that no really good waterproof adhesives were available, which limited it’s use. 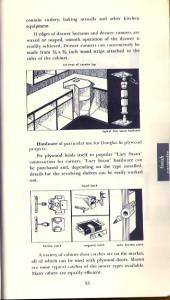 It was WWII that was plywoods real proving ground, and after the war the technology and use of the material really began to take off. 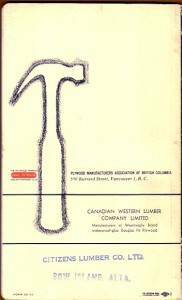 In 1950, five Canadian companies founded the Plywood Manufacturers Association of British Columbia (PMBC), which eventually evolved into the present-day Canadian Plywood Association (CANPLY). 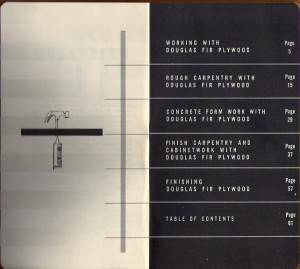 The Canadian Standards Association published the first Canadian Plywood Standard in 1953 based on specifications developed by PMBC. As part of the Trend House Program in the early 50s, plywood plays a major role in both the structural and interior construction of the houses, and indeed when we moved into the Calgary Trend House, there was not a single piece of drywall in the place, rather, all of the interior walls were sheathed in either 3/4 inch plywood or some of the other woods (Hemlock, Western Cedar) that was being promoted by the sponsors of the program. 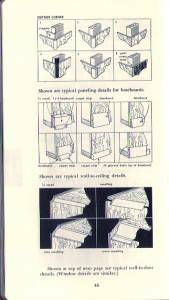 Always on the look out for documentation that represented the technology of the house, we came across a small handbook. 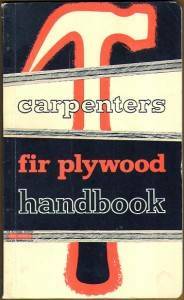 produced by the PMBC called “Carpenters Fir Plywood Handbook”. 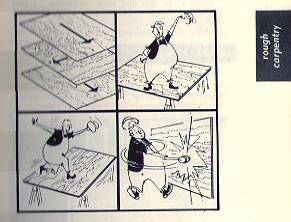 Not only is it a great guidebook for carpenters and architects, it is filled with fantastic drawn illustrations, not only technical, but great cartoony “how to work with plywood” drawings that remind me of the Disney “I’m No Fool” series of shorts we’d watch in elementary school in the early 70s.